Thursday marked the beginning of one of the most anticipated holidays for prospect-watchers: the MLB First-Year Player Draft. The Red Sox made 40 selections, and SoxProspects.com recapped the whole thing. In the first round, the Red Sox picked left-handed pitcher Jason Groome (pictured) with the 12th overall selection. SoxProspects.com broke down the selection of the lefty, who was thought by many — including MLB.com and Perfect Game — to be the top prospect in the field and a candidate for first overall selection before he dropped to the Red Sox. With their only other selection on the first day, the Red Sox picked CJ Chatham, a shortstop from Florida Atlantic University. SoxProspect.com examined the scouting report of the tall college shortstop. In SoxProspects.com podcast Episode 98.5, our gurus discussed the selections of Groome and Chatham, including the signability and makeup concerns that come with the Red Sox' first-round pick. On the draft's second day, spanning rounds 3-10, the Red Sox selected three pitchers and five position players. SoxProspects.com reviewed each one of them: Florida righty Shaun Anderson, Arizona third baseman Bobby Dalbec, Maryland righty Mike Shawaryn, Oregon righty Steve Nogosek, Arkansas-Little Rock outfielder Ryan Scott, prep catcher Alan Marrero, Texas-Arlington outfielder Matt McLean, and prep shortstop Santiago Espinal. On the third day of the draft, the Red Sox selected 14 pitchers and 16 position players, with a majority of the 30 picks coming from the college ranks. SoxProspects.com rounded out the draft with a recap of the third day. 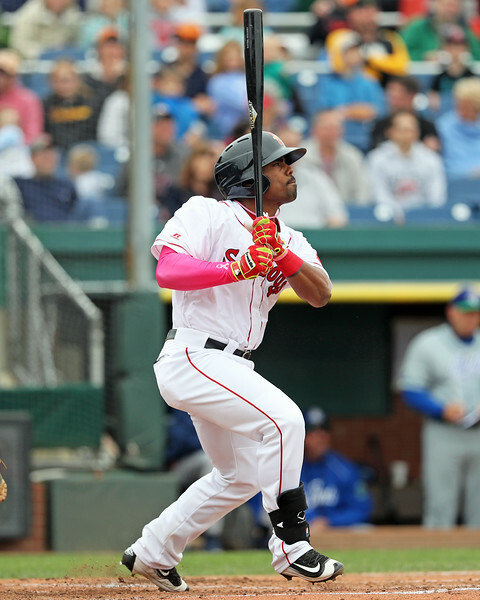 Among the Red Sox prospects already in uniform, outfielder Henry Ramos received a promotion to Triple-A Pawtucket. The 24-year-old hit .281/.333/.406 in 42 games with Portland this season. After terrorizing Carolina League opponents at the top of the Salem lineup, second baseman Yoan Moncada and shortstop Mauricio Dubon were selected as Carolina League All-Stars. The Greenville Drive will be well-represented at the South Atlantic League All-Star game. Josh Ockimey will start at designated hitter while his teammates Luis Alejandro Basabe and Tate Matheny will serve as utility outfielders. Right-handed pitchers Jake Cosart and Roniel Raudes were also tabbed for the midseason honor. Roenis Elias pitched seven shutout innings for the PawSox this week, and Tim Britton of the Providence Journal says he could be starting for Boston very soon. Matt Collins at Baseball Prospectus examined the technique and value of the Red Sox farm system’s grooming of utility players like Marco Hernandez and Mauricio Dubon. Rob Bradford at WEEI.com reports that Michael Kopech, the Red Sox’ sixth-ranked prospect, will return from injury to make his season debut for the Lowell Spinners on their Opening Night June 17. Though Jason Groome may have been the most talented prospect in the draft, Alex Speier of the Boston Globe discusses some of the questions that caused other teams to pass on the high school lefty and why the Red Sox did not. For Red Sox first-rounder Jason Groome, his selection by Boston was special after growing up a Red Sox fan in Yankees territory, John Tomase reports for WEEI.com. Ben Buchanan at Over the Monster looks at how the Red Sox are still gaining value from the draft, even if they cannot sign top pick Groome. The Red Sox spent their 20th round pick on a familiar name, Nick Lovullo, son of bench coach Torey Lovullo and 2015 draftee. Evan Drellich of the Boston Herald recounts the special day for father and son. Reliever Brandon Workman could start to make rehab outings soon after he is reevaluated at the end of June, Jason Mastrodonato of the Boston Herald reports. After his 2015 season spanned three levels, Tavarez (pictured) has settled into Portland this year. Since a horrid start to the year, Tavarez has consistently improved throughout the season. His OPS jumped from .553 in April to .728 in May and now sits at 1.172 through nine games in June. His recent success included his first home run Sunday, during a game in which he reached base in all four plate appearances. Haley pitched six shutout innings June 6 and followed it up with 4 2/3 innings of one-run ball. Haley has been impressive in his second season at Double-A, sporting a 2.20 ERA and 1.11 WHIP. He had performed well at every level of the minor leagues prior to a down year with the Sea Dogs in 2015 but seems to be righting the ship this season.